The main opposition leader of 11th parliament and also the chairman of Jatiya Party (JP) has been victimised of wrong treatment, said party source. Jatiya Party (JP) Secretary General Moshiur Rahman Ranga made this statement while addressing a press briefing at a hotel in Rangpur city on Sunday afternoon. “Our party president’s liver and some other organs were damaged as doctors prescribed him cancer medication,” Moshiur Rahman Ranga told these referring doctors in Singapore. He also told that, the doctors in Singapore said Ershad is not a cancer patient. "After treatment in Singapore, now he is feeling well," he added. 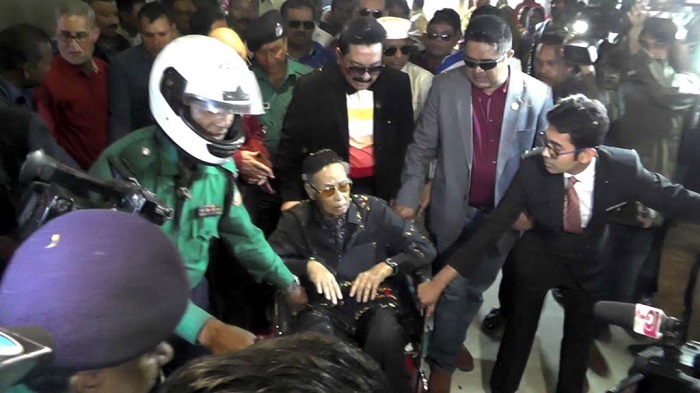 The former military ruler HM Ershad on Sunday went to Rangpur on a three-day visit. He left Shahjalal International Airport for Rangpur cantonment on a helicopter around 11am. He reached there around 12pm and then went to Hotel Grand Palace in a wheelchair, said sources. Ershad will take part in several party and personal programmes on March 4 and 5, and will return to Dhaka on Wednesday by helicopter. JP Secretary General Moshiur Rahman Ranga and presidium member, Major (rtd) Md Khaled Akhter, and Ershad's son, Erikh Ershad, are also accompanying him.